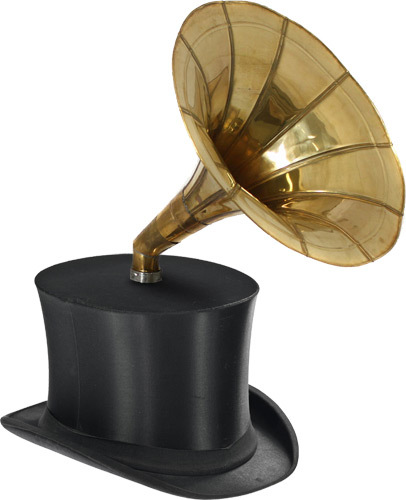 This fashionable item has all the advantages / disadvantages of looking like a gramophone on your head. Once it has locked-on to a target, the brass horn will stay pointing in that compass direction. This allows the wearer to move around at will whilst enjoying an unbroken stream of directional audio. And by collecting the rays of the sun, possibly be able to grow tomatoes (at least in the northern hemisphere). Which ear is the south facing one? The sound is directed into one or two ear plugs which descend from the hat brim. The act of lowering the ear plug opens the valve to that audio passageway. The target needn't be always south, a quick adjustment allows you to listen exclusively North-Northeast. The mechanics of the device may be entirely mechanical (using inertia and smooth bearings, or gimbals and flywheels) but more functionality is gained by having electronic manipulation of the horn. The standalone model has a built in mini-gyro, accelerometer and compass but the delux model includes bluetooth connectivity to gather this info from your smartphone. Two friends, who both own Bluetooth South Facing Ear Trumpet Hats, can now sustain a conversation over many metres in a crowded place effortlessly. Once enabled, the app uses triangulation, internal compasses and GPS to ensure the ear trumpets remain aligned. Yes, you too can talk with your friends at a distance, all you need is an expensive phone and a Bluetooth South Facing Ear Trumpet Hat! We could all get upward-facing ear trumpets, and become a sort of crowdsourced SETI. I foresee issues arising in wet weather. Then again, I have been foreseeing issues in all other meteorological conditions too. Luckily a third, and more expensive iteration of the device also exists. This features miniature transducers in the earbuds which can receive audio encoded in an electromagnetically transmitted signal. An additional chin-area miniature trumpet collects your spoken words and mixes them into the aether whereupon the recipient or recipients can decode the signal using their mobile phones and electronic Bluetooth South Facing Ear Trumpet Hats to allow direct communication whilst totally bypassing the horn area of the device. Amongst the numerous benefits provided by this arrangement is the lack of continuous trumpet alignment being completely necessary, meaning your ear trumpet can twirl at random, or even point completely the wrong direction while you talk at length with your friend or colleague, leaving passers-by bewildered and astonished at your ability to communicate over a distance despite the apparent malfunction of your South Facing Ear Trumpet Hat. I you really want it to lock on then you'll want one of the ears to emit a continuous stream of ultrasonic toots and the other to scan for reflected ultrasonic toots. Or maybe do it alternately.